More than half of land that was home to a Teesside steelworks has been brought back under public control in a deal which promises thousands of new jobs. Tees Valley Mayor Ben Houchen said the development of 1,420 acres of the former Redcar steelworks site could begin before the end of the year. 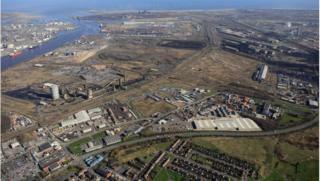 It has taken 18 months to agree the land transfer from Tata Steel Europe to the South Tees Development Corporation. Mr Houchen said about 100 inquiries about the land had been received. More than 4,000 jobs were lost when the steelworks closed in October 2015. The Conservative mayor who is also chairman of the corporation, said the government had committed £137m to the project since 2017, which included cash to clean up the site. He had threatened to "instigate compulsory purchase proceedings" if agreement with Tata was not reached by the end of February. Mr Houchen said: "It has taken a lot of blood, sweat and tears, but this means we can go back to our pipeline of investors and show them that we now have the land for their huge, multi million-pound projects. "Although this is a long term project, this deal today will prove to be one of Teesside's most important milestones in decades. "We have already received £137m since I was elected, and I'm determined to go even further to ensure central government coughs up and fully supports this project." Mr Houchen said negotiations to secure the remaining 870 acres of land, owned by SSI, were ongoing. He said he expected the project to create about 22,000 jobs over the next 20 years.